Facilities dealing with any type of liquid need to have an effective spill response plan in order to prevent small accidents from becoming total disasters. Having the right spill control equipment, providing the right training for all of your employees and coming up with procedures that will work best for your facility are the three most important things you can do when it comes to controlling a spill. Only by combining these three things you’ll ensure complete preparedness. There are several steps that you can take to ensure an effective spill response. These steps may vary from facility to facility, but generally, they go as follows: assessing the risk, choosing the appropriate personal protective and spill control equipment, confining the spill and stopping the source, evaluating the incident and implementing a cleanup, decontaminating the spill site and doing a complete report on the incident. Assessing the risk is the first step, and you should take it the moment a spill occurs. It includes determining the risks that the spill may have on people’s health, the environment, and the entire facility. The person handling the containers of liquid that spilled can assess the risks instantly, or if the spill occurred on its own the assessment may require some investigation. 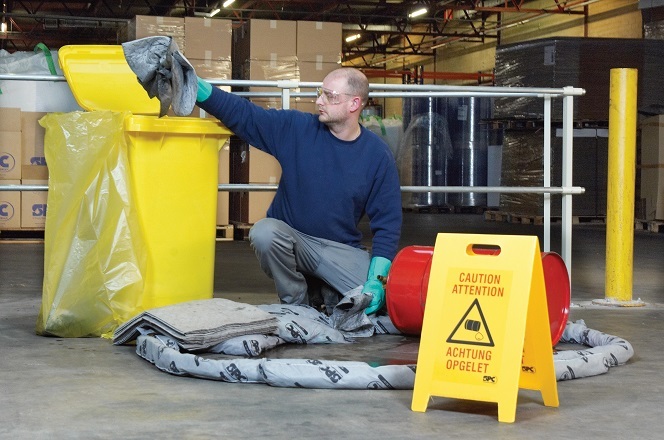 Generally, the spilled material can be identified from the SDS (Safety Data Sheet), or the container label. Once the risk is assessed, the first responders to the spill need to get the necessary PPE and find the nearest spill kits and other necessary equipment to contain the spill. When picking out PPE, consult the SDS, PPE and Chemical Manufacturers literature. If the danger isn’t properly assessed and the spilled material is unknown, assume the worst and use the highest possible level of protection. Then comes confining the spill and stopping its source. This can be a simple or extremely difficult task depending on the size of the spill. With that said, it’s important to use the right absorbents and the proper size of the spill kit. Once the right spill kit and absorbents are chosen, the first responders should limit the spill area by confining, blocking or diverting the spill. Stopping the source may happen even before the spill has been completely confined, but again, this depends on the size of the spill. It can be as simple as turning the container upright, or plugging a leak from a damaged container or drum. Once the leak is stopped and the spill is confined, it’s time for another assessment and developing a plan for cleaning up the affected area. This involves decontaminating the site, equipment, and personnel by neutralizing or removing the hazardous materials which have accumulated during the incident, which can include removing and disposing of contaminated media. When that’s done, it’s time to complete all the necessary spill notifications and reports required by national and local guidelines, otherwise, you might be subjected to severe fines. Generally, the reports include medical reports, local district or council reports, company safety reports and environment agency reports.